On November 16, 2010, two Marines and a Navy Chaplain rang Veronica Ortiz Rivera’s doorbell in Camp Lejeune, N.C. It was raining that day, and she had just mailed packages full of snacks, “I Love You” notes from the kids and photographs to her husband, Javier. She was smiling until she saw who was behind the door’s frosted glass. After she heard that her husband had died, Veronica remembers screaming for the Marines and chaplain to leave, but they wouldn’t. They were waiting for one of her friends to arrive to help her with her children. She remembers that her friend picked up the children from school for an impromptu sleepover and then sent them off again to school the next morning. But mostly, Veronica has difficultly piecing together what happened that day. 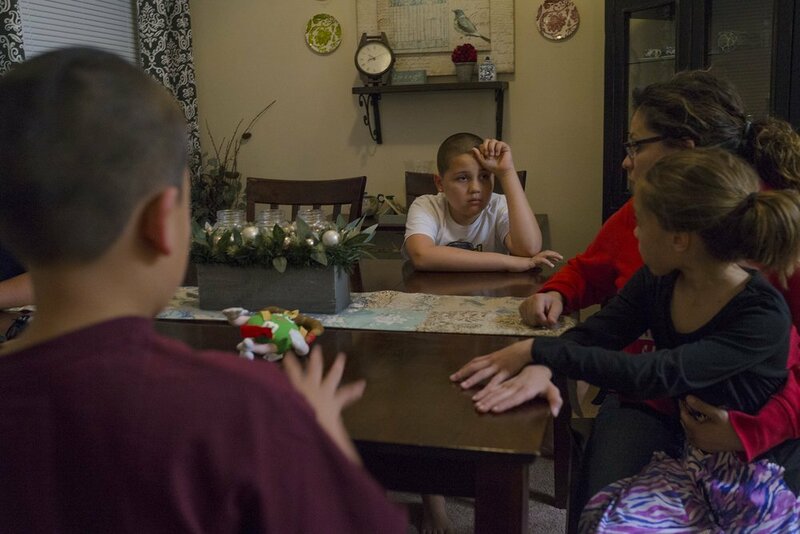 Their two oldest kids, Alyssa and Andrew, were eight and five at the time, and they wondered if the sudden sleepover and the air of secrecy meant their father was coming home early to surprise them. Things were the same for Anthony, who was three. He walked into preschool that morning expecting good news. Instead, he was told he’d never see his father again. This is their story. The explosion woke Second Lt. Jason Blydell, and he jumped off his cot as his patrol base shook violently. The radio crackled: “Stand by, casualty report… We have one urgent surgical.” Then silence. Fifty or so Marines crowded around the radio. 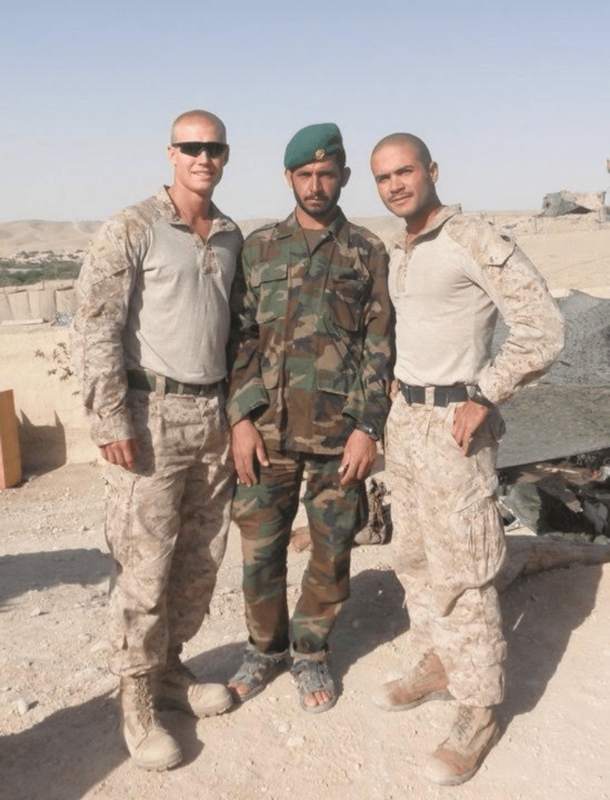 They were from Patrol Base Griffin, the northernmost Marine outpost in Afghanistan that was manned by the Second Platoon, Alpha Company, First Battalion, Eighth Marines. The base was their home. Beige walls. Beige floor. Beige Roads. Blue skies. Half the size of a football field. Miles from help. Surrounded by Afghanistan. One way in. One way out. One generator hums and sputters outside the sleeping quarters. The silence between radio transmission echoes off of the twelve-foot security walls surrounding them that are hardened by the sun. More beige. Blydell scanned the packed room and waited for medical evacuation directives, but the voice of the Marine on patrol came across the radio. He knew one of his Marines was dead. Blydell and his Marines were roughly one kilometer away. While he stewed in a mix of fear and failure, he knew now wasn’t the time to show emotion – or “weakness,” as he called it – in front of his men. He said he tried to be as stoic as possible, to appear as he knew what he was doing and to be a “strong” leader, but quietly, he couldn’t stop imagining what was happening at the epicenter of the blast. 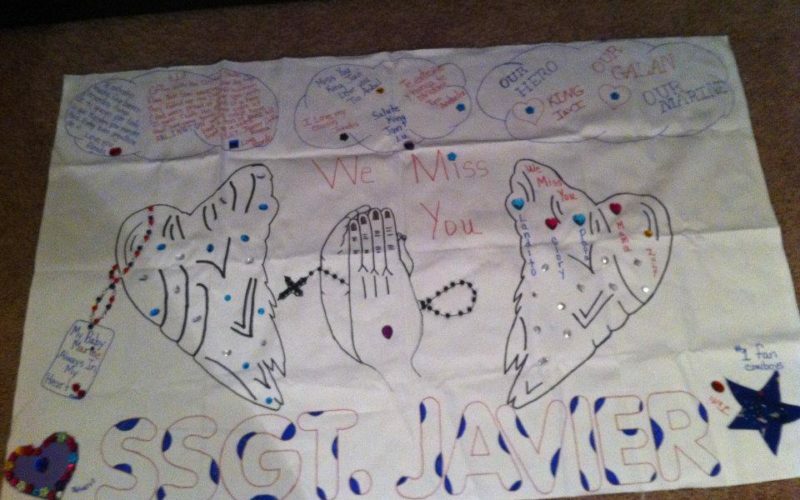 The Marines on the foot patrol stared at Javier’s body with disbelief. They all described similar accounts of fear, confusion and horror. They knew Javier as a leader who wouldn’t ask his men to do what he wouldn’t do himself. So when Javier inched across the ground on his hands and knees that morning to investigate a suspicious patch of dirt that might contain explosives, the Marines thought nothing of it. As Javier inched closer toward the explosive, the men stood or knelt as they peered across the beige battlefield. They had always found the buried explosives before anyone was hurt. They feared the blast, but they weren’t ready for it. The explosion changed everything. Fifteen pounds of homemade explosives detonated beneath Staff Sgt. Javier Ortiz Rivera’s upper torso. 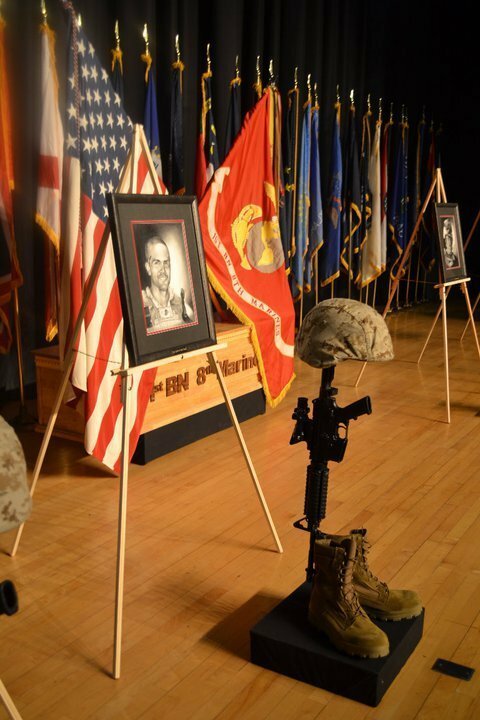 When the dust settled, the Marines found his torso with wounds to his face, arms and chest. His rifle was mangled. His wedding ring was ripped from his hand. The Marines would never find it. Javier, the 26-year-old New York native, was dead. When David Ketron, a sergeant and squad leader from Baltimore, heard the blast, he dropped his Velveeta macaroni and cheese – a treat sent from home – and grabbed a handful of Marines. The group rushed to the blast site, but stopped when they saw Javier on a stretcher being carried by a group of men who could barely breathe. They were each wearing more than fifty pounds in body armor, weapons and ammunition and had ran with Javier’s body on a stretcher for nearly one mile. With each step the Marines took, Javier’s lifeless hand bounced on the stretcher. Javier wasn’t the first of his friends that Ketron had seen with these fatal injuries. 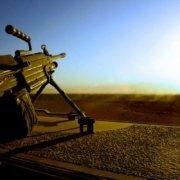 “My squad leader in Iraq died very similarly,” said Ketron. “As soon as I saw Staff Sgt. Ortiz in the same shape, it brought me back to where I was [mentally] in Iraq.” This was the first time most of these Marines had seen someone in their group die, and Ketron didn’t want to show any overwhelming emotion in front of his men. He wanted to keep his sense of helplessness private. Ketron and Javier had been close. While he looked at the body on the stretcher, Ketron remembered their talks about relationships and religion. He holds those times with Javier close to this day, and he knows those conversations helped him become a stronger person and have a stronger marriage with his wife, Chelsea. Not everyone in Second Platoon walked away with such cherished memories, and some still have difficulty talking about Javier’s death. Blydell felt as though part of his duties as their platoon commander was to place Javier’s body on the medical evacuation helicopter. Once the pilots were inbound toward the platoon’s patrol base, Blydell strapped on his gear and ran to clear a landing zone of other possible explosive devices. The last thing Blydell wanted was to lose another Marine, he said. With the ground clear, the helicopter landed, and Blydell grabbed one handle of the stretcher and walked beside Javier for the last time. Javier wasn’t the only Marine wounded in the blast that day. Lance Corporal Zach Bryan was standing beside Javier when the explosion occurred. He was knocked unconscious and needed to be evaluated at a hospital. As Javier and Bryan disappeared across the horizon in the helicopter, Blydell savored feeling lost in the dust the helicopter’s rotor wash kicked up. He lost it as he screamed into the dust storm, regaining his composure once the air cleared. He had a war to fight and men to protect. He didn’t have time to mourn. Bryan sat inches from Javier’s body in the helicopter. He felt guilty when he stared at the corpse. Bryan had always been belligerent, he knew, and acted as though he was a “gift to machine gunnery”, but none of that had mattered to Javier. 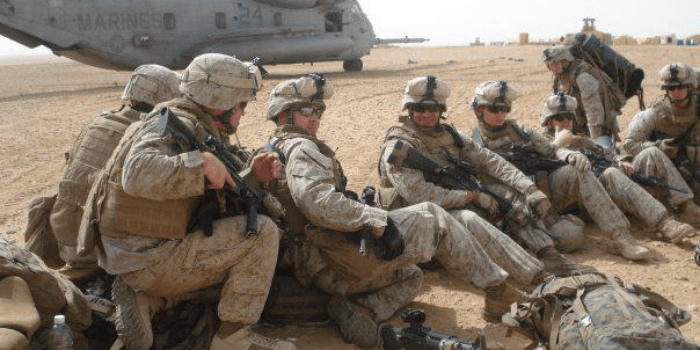 Bryan’s platoon sergeant, who was three ranks his senior, had cared only whether a Marine acted like a Marine and did as a Marine is supposed to do: be proficient and disciplined when following any order. Bryan didn’t always do the latter. Bryan cannot forget how Javier looked lying in the back of the helicopter and wonders how he would feel if he hadn’t seen Javier’s body. Blydell wonders if he should have looked under the bloodstained sheet draped over Javier’s face. “When you think of an IED, you think of missing limbs,” Bryan said. “He was leaning over this thing. I still pray that he didn’t feel a thing.” Bryan still struggles through his days and nights trying to cope with seeing Javier in that condition. He tried everything to forget. Talking with friends. Drinking. Work. School. Therapy. Brian said that it feels “wrong” for him to get over the loss of Javier. The helicopter ride to the hospital lasted 30 minutes. Bryan choked up every time the wind lifted the sheet off Javier. He didn’t want to look away because he didn’t want Javier to be alone. 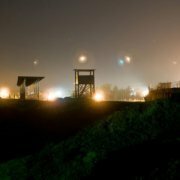 He forced himself to peer out of the windows until the helicopter landed at Camp Bastion, one of the largest trauma hospitals in Afghanistan. Despite his brain injury, Bryan refused a wheelchair. He walked alongside Javier into the hospital. 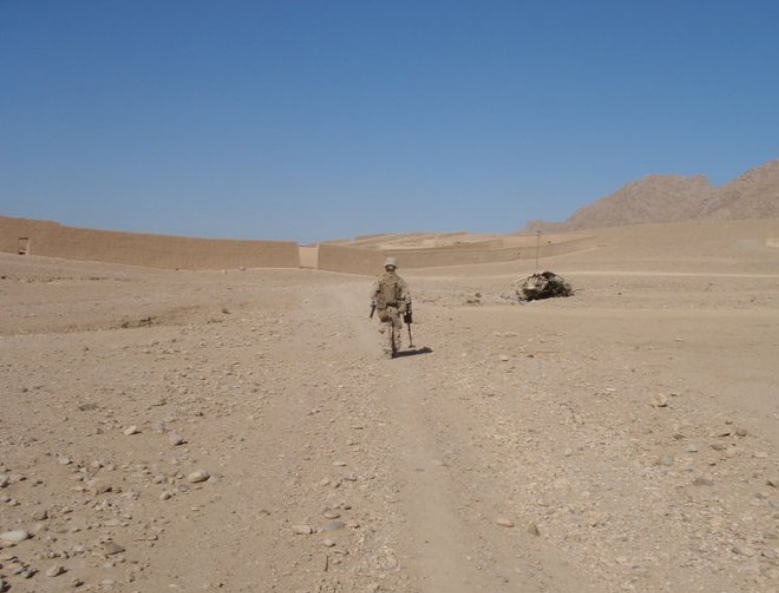 Then he walked away from his platoon sergeant for the last time. Back at the company’s headquarters near Patrol Base Griffin, Captain Daniel F. O’Brien, the Company Commander for Alpha Company at the time, was preparing to inform nearly 200 Marines and sailors that Javier had been killed and Bryan was wounded, but he had to wait for confirmation from Camp Bastion’s field hospital. Once verified, O’Brien picked up the radio handset and spoke to his men, many more than a dozen miles from him at various patrol bases like Javier’s. O’Brien knew what he was going to say. He had rehearsed those words dozens of times. Not having to look into anyone’s eyes as he spoke made the delivery easier. 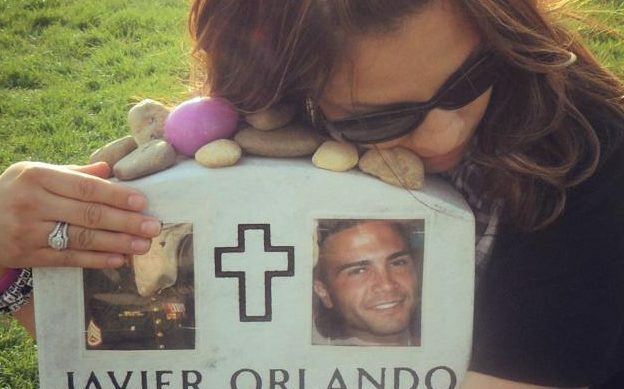 Over the years, people who knew Javier and Veronica would post on her Facebook to remember and reflect. Friends left hundreds of comments on Veronica’s feed. Some wrote just three simple words, “I love you,” while others began with, “I remember when… .” Facebook kept the wound fresh for Veronica. In some ways she treasured that, knowing that Javier wasn’t forgotten and that she wasn’t alone. She envied all the spouses who could hug their husbands, she wrote. She once loved seeing those signs, but now, she thought that the people who put them up were heartless. When she pulled through the gate of Camp Lejeune to drive to her home once Javier had died, she felt the same about the Marine Corps. When everyone left Veronica’s house, she slept alone in the bed that she once shared with Javier. She cried as she stared at pictures of her husband. She knew that she’d never see Javier’s name pop up for a text or a call. That she’d never hear him talk in his sleep or feel him twitch as he fell into a deep slumber. That she’d never fall asleep to the sound of his heartbeat ever again. Her biggest fear was now her reality. After Javier’s funeral at Arlington Cemetery, the Marines who were still in Afghanistan tried their best to stay positive for the rest of their deployment. Naveiro had met Veronica and her children casually before their deployment. Having Veronica as a friend wasn’t necessary to his relationship with Javier because Javier was his platoon sergeant and by nature of that relationship, they couldn’t be friends. Still, Naveiro doesn’t remember Javier for his stern leadership, but rather, his fear of mice. Critters were a constant in Afghanistan, he said, but the Marines always had a good laugh when a mouse got into Javier’s living quarters. When Naveiro went to bed on November 16, 2010, he knew nobody would wake him because of a mouse. Within the first few hours, Naveiro already missed Javier. Instead, Naveiro woke up to his company commander, Captain O’Brien. He had come to Patrol Base Griffin to speak with the Marines. He kept it simple, he said. Put it all aside because Javier wouldn’t want them to give in because he died. There was no time to mourn. They had a job to do. 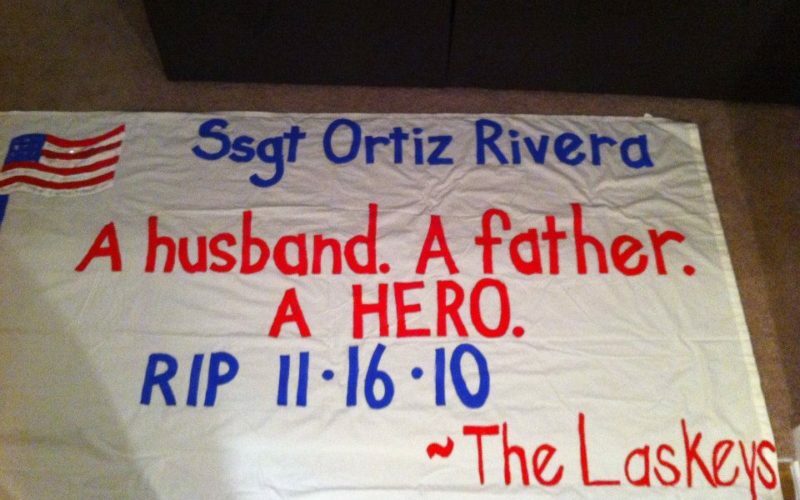 In the two months before Javier’s death, Staff Sgt. Alex Reyes had visited him often at Patrol Base Griffin. The two had known each other for more than three years. Prior to their deployment, they worked together as instructors at an entry-level combat skills school in North Carolina. The two New Yorkers – Javier from Rochester and Reyes from Bronx – bonded as they competed for a meritorious promotion. Reyes soon realized that Javier made sure his family was the focus of everything he did. Along with the 60-hour workweeks spent teaching, Javier went to school and ran his up-and-coming landscaping business. He often took his oldest son, Andrew, to mow lawns with him. So when Captain O’Brien told Reyes that Javier was killed, Reyes requested to leave immediately for Patrol Base Griffin. Their mine-resistant vehicles churned up the dirt roads toward Patrol Base Griffin, and when they parked their military vehicles and stepped out, Reyes saw the outpost in a different light. He described the men he had always joked with as now having a somber demeanor. He knew they were defeated. Reyes left Patrol Base Griffin shortly after Javier. His platoon drove trucks back to their patrol base, Habib. That was where Reyes discussed with his leaders a promise he had made with Javier. Before their deployment, they promised to call each other’s wives if the other was wounded or killed. Military regulations outlawed Reyes from doing so, but he called anyway. Staff Sgt. Alex Reyes, left, on patrol outside of Patrol Base Griffin with Second Lt. Jason Blydell, center, and Sgt. Raphael Peguero. Photo courtesy of Veronica Ortiz Rivera. Reyes called Veronica three times before returning home. She always cried when they spoke, and he didn’t want to risk losing her friendship. “Something inside of me knew it was worth her being angry with me,” he said. “I needed her to know I still cared. I didn’t want her to forget that.” Those phone calls were some of the most difficult calls he has ever made. Because of Reyes’ friendship with Javier and the Marines and sailors of Second Platoon, the leaders of Alpha Company decided to fill Javeir’s billet – his roll as platoon sergeant – with Reyes. On Reyes’ third deployment, his platoon sergeant was killed during their third patrol inside of Ramadi, Iraq. He had lost a leader once before, and he packed his things and moved in with his new platoon. Many of the Marines resented Reyes when he first arrived. He’d been leading a team of vehicles used to sweep the roads for explosives and deliver supplies. They trusted and respected him, but for David Ketron, the squad leader who helped carry Javier’s stretcher, Reyes was an outsider. Captain O’Brien said filling Javier’s billet with Reyes was an easy decision. He knew he could trust Reyes to let them mourn, but not let them become complacent. Second Lt. Jason Blydell, far left, and Staff Sgt. Alex Reyes, far right, stand with the four squad leaders of Second Platoon. Photo courtesy of Veronica Ortiz Rivera. “It was a combination of taking care of them and making a decision that would help us ensure we would accomplish the mission,” said O’Brien, who remembers Javier as having a smile halfway between cocky and confident. He was always proper, he said, but if he wasn’t so proficient at his job, he would have been obnoxious. Javier was always proper, said O’Brien. He was also charismatic, and he loved every minute of it. “That’s why I sent Reyes — the two of them are from the same cut,” he said. But Lieutenant Blydell, the platoon’s leader, wasn’t so sure. Veronica didn’t want to be at the airport when the Marines returned home from Afghanistan in April 2011. Instead, she hung a sign with a quote about Javier’s men from one of his letters. She had started to heal and didn’t want to make anyone sad. 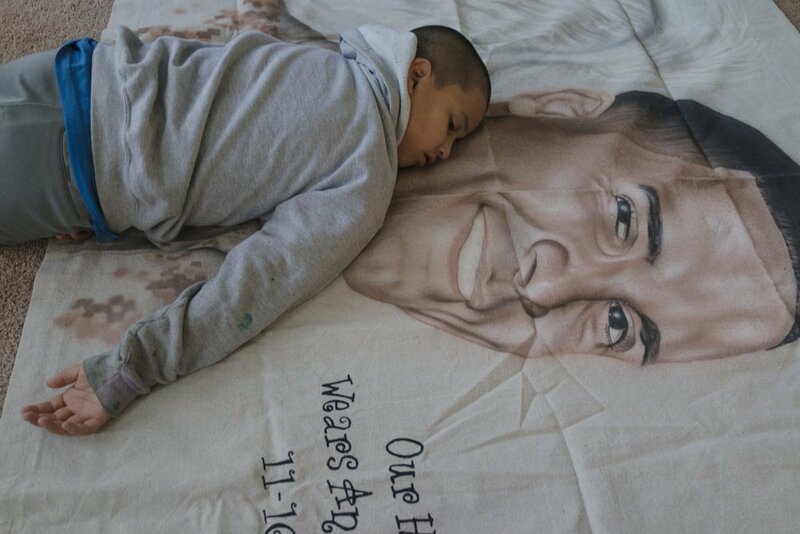 Her friend made her a quilt out of Javier’s old clothes, and Veronica kept a candle lit alongside Javier’s photos, his burial flag and dog tags. What Veronica didn’t realize was that even though the Marines were happy to be home with their families, they couldn’t stop thinking about Veronica. “Seeing everyone hug their loved ones, I just couldn’t imagine what it felt like [for Javier and Veronica] to not have that — it was sad, and it absolutely ruined my homecoming,” said Blydell, the platoon commander who helped put Javier’s body on the helicopter. 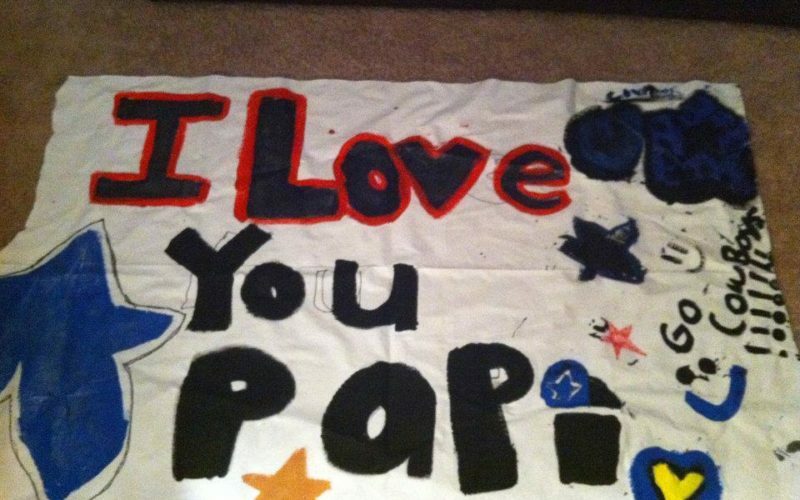 While she wasn’t there when Javier’s Marines arrived at Camp Lejeune, she and the kids decorated sheets in Javier’s memory that she hung along the chain link fence at the entrance to the base. 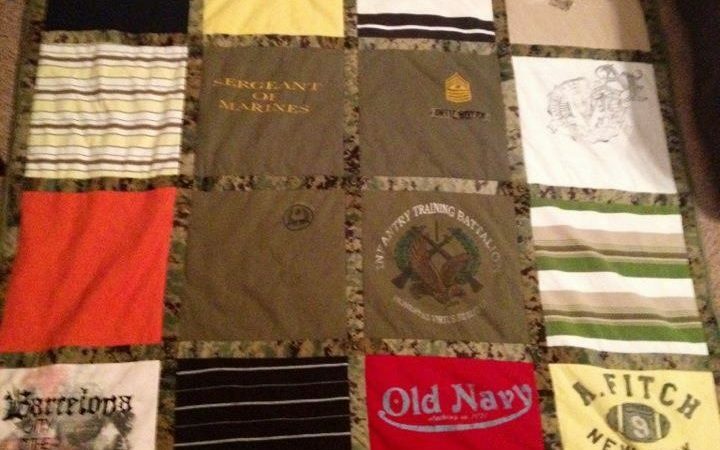 The sheets were a sobering reminder for the Marines as they drove past the base’s front gate. Reyes stepped out of the bus to greet his wife, Christina. They then gathered his belongings and drove straight to Veronica’s house. No food. No stops. She knew they were coming, but couldn’t believe when he knocked on the screen door at the front of her home. The three of them hugged and cried. Reyes had waited months for this moment. The Ortiz Family, center, stands alongside the Marines and Navy Corpsman of Javier’s platoon during Javier’s posthumous Bronze Star ceremony. Later in the week, the Marines of Second Platoon invited Veronica to the base so she could meet the men whom Javier had served with. She cried. The Marines cried. Veronica apologized for their pain. The Marines apologized for her loss and that they couldn’t save Javier. For Naveiro, the Marine who helped carry the stretcher after the blast, this introduction was one he wouldn’t forget. More than a thousand Marines, sailors and families from First Battalion, Eighth Marines gathered in a movie theater aboard Camp Lejeune upon returning from Afghanistan in 2011. Photo courtesy of Veronica Ortiz Rivera. On April 18, 2011, Veronica and about twelve family members walked alongside Sgt. Rafael Peguero down the aisle of a theater on base. Five months after leading Javier on that deadly patrol, Peguero was ushering Javier’s widow, children and family onto the stage. She struggled to walk, gasping for air as she cried for Javier. 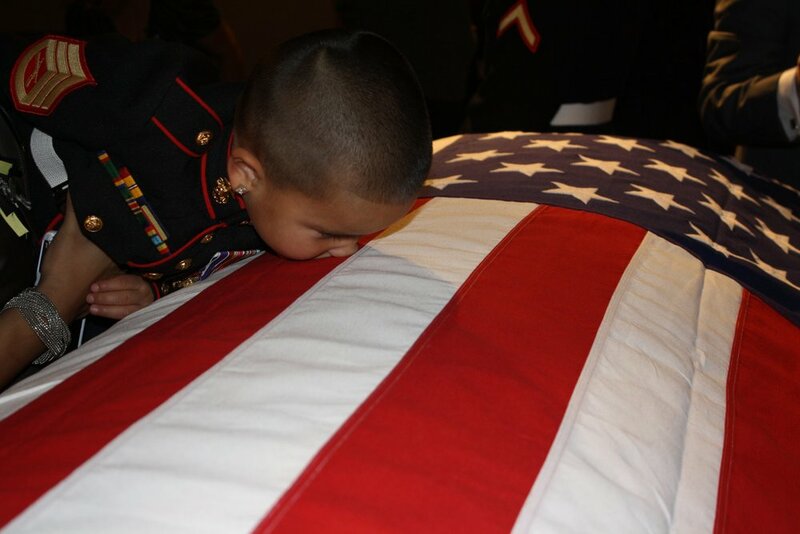 All the Marines sitting in the audience knew Javier, and they could no longer hold back their tears as they saw Veronica fall to her knees while clutching the military dog tags on Javier’s memorial. Veronica threw a party that night to celebrate Javier’s life. Marines and sailors danced with a cardboard cutout in Javier’s likeness. Alyssa wore a white belt from his dress uniform around her waist. Veronica smiled and cried at the same time that whole night. The group sat together and watched a video that she had made, The Life of Javier Ortiz Rivera. 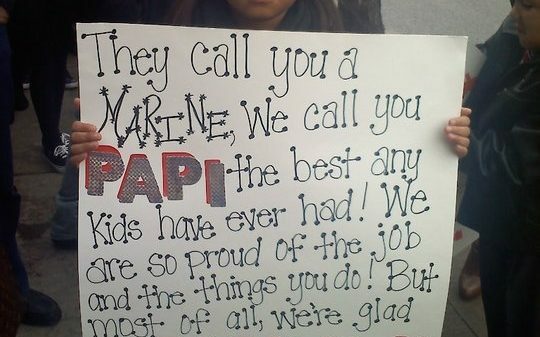 All of the Marines and sailors were present, and Reyes, the Marine who took over for Javier, said that the event was “the most perfect way for everyone to come home from Afghanistan.” The Marines had been suppressing their emotions when they were away, and Reyes said the party enabled them to talk about and express what they’d ignored for months. The night of the party was the first time since Javier’s death that Veronica felt any kind of relief. Not without pain, she realized how many people loved Javier and knowing that has helped her recover from his death. 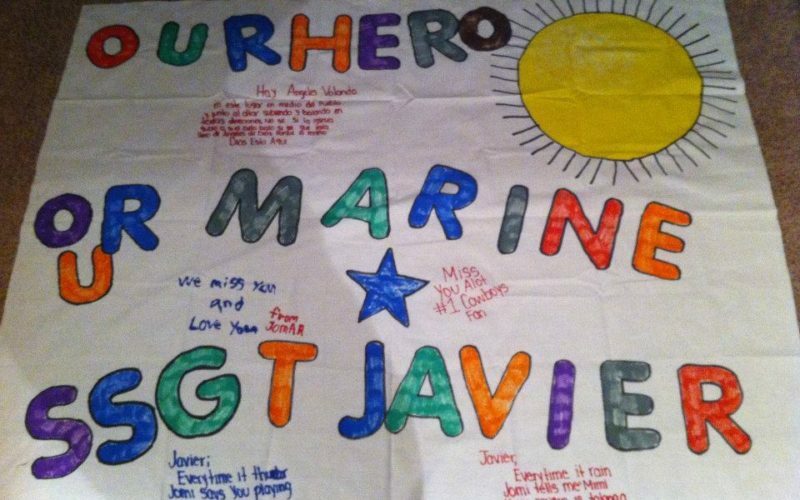 Javier was a father figure to one of his junior Marines, Matthew Ballard. Ballard’s mother and father abandoned him early in life, but losing Javier was more painful. As a child, Ballard said he had questioned his parents’ love, but he never questioned Javier’s. Ballard didn’t know much about Veronica and the kids when Javier died. Learning about him through Veronica during the years since his death has made him even more grateful to have known Javier. Being a part of Veronica’s life has been a healing experience for him. During a ceremony aboard Camp Lejeune on September 2, 2012 – just weeks before the two year anniversary of Javier’s death – Veronica pinned Ballard’s corporal chevrons onto his uniform when he received his meritorious promotion. Anthony was three when his father died, and he hasn’t stopped missing being tickled since. There isn’t much that he says he remembers about his father, but there is one thing he hopes he never forgets. Anthony knows exactly where he got his silly ways. One of his few vivid memories of Javier is when he took a nap in a rental stroller at Disney World before leaving for Afghanistan. Looking at pictures “makes [him] have tears come up inside of [his] eyes,” he said. If there’s a chance that Javier comes back to visit, Anthony has it all planned out. Anthony believes that his father would be proud of him for taking care of his mother, but “if mom blurts everything out, then he would be upset,” Anthony joked. Anthony constantly asks his older sister, Alyssa, to tell him about their dad, and that’s the one thing about him that she said doesn’t bother her. Andrew had wanted his father to teach him how to be a man and about respect, loyalty and integrity. “I really wish he was here to teach me how to be just like him,” he said. Returning to school and having to explain to friends that their father had died kept the pain fresh, Andrew said. While they know their friends were just trying to show that they cared, it actually made moving on more difficult for Alyssa and Andrew. They had trouble thinking about other things. “So much pain” is why Andrew, now 11, said he hides his emotions. And even though he doesn’t like talking about his memories with his father, he imagines that time together with his father to ease the pain. Andrew wants to enlist in the Marine Corps and become an infantryman, just like his father. When he is old enough, he wants to carry on what his father started. His mind is made up, and no one can change it — not even his mom. More than three years after Javier’s death, Veronica started talking to another Marine, Junior Vasquez. Veronica and Junior had met a through Javier years before, but they were just acquaintances. One day, the two talked about each other’s memories of Javier while eating cheeseburgers at a mutual friend’s barbeque. They wouldn’t see each other again for months, but they messaged each other on occasion. Veronica liked the attention. She also valued Junior’s understanding of her loss. He was sweet and not pushy, she joked. “He seemed like he genuinely cared,” but the two felt uneasy about being attracted to one another. This relationship was her first since Javier died. Even though going on a date felt disrespectful to her, a date did happen. The two had a quick dinner at a small restaurant. Then they went on another date, and they always met in secret — her kids couldn’t know. She didn’t want to hurt them. Junior, the Hollywood, Fla. native, has never regretted being with Veronica. He didn’t think he would ever develop feelings for her, and when he did, he didn’t think she’d feel the same. The relationship grew slowly with hours of phone calls and texts. Neither wanted to rush things. Six months into their romance, Veronica knew she had to tell the kids. At first, none of them liked Junior. They felt as though he wanted to replace their father. They criticized Veronica when she saw Junior, but with time, he grew on the family. Junior taught Anthony how to ride a bicycle. Today, he is advising Alyssa about boys. When Veronica was pregnant, she was scared to tell the kids. Once she told them, they were ecstatic, she said. As soon as they decided on the baby’s name, Kaleb, all three children began referring to him as their stepbrother, and Javier, as Kaleb’s stepfather. Telling Javier’s Marines was no less scary. Many of the Marines had randomly met Junior at a local bar while he was on a date with Veronica. 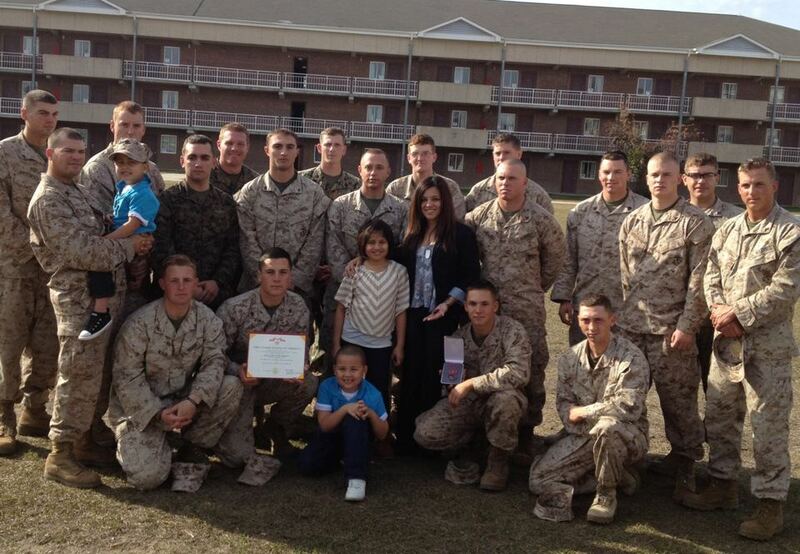 The Marines first saw Veronica, who wasn’t yet pregnant. After a string of hugs and small talk, they asked why she was there and why she looked upset. “Some guy tried hitting on me while Junior was grabbing us a drink, but he was being very disrespectful, so when I told him no, he said some really awful and hurtful things,” she said. When Junior came back with drinks, Veronica was noticeably shaken. She explained, and he confronted the man. He asked him to apologize. Some people took longer to adjust to Veronica’s new life. 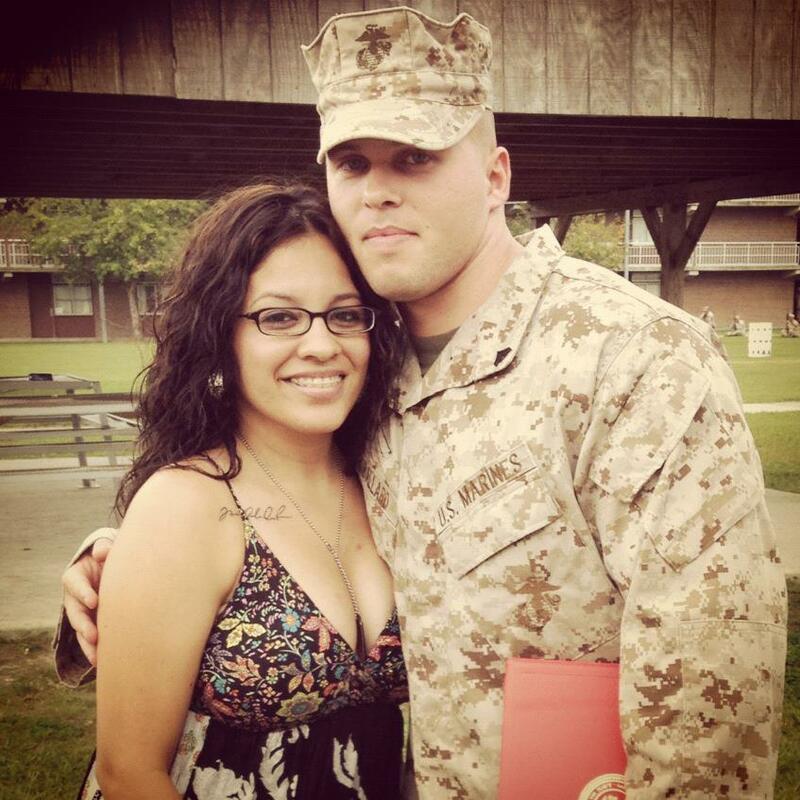 Bryan, the Marine who flew on the helicopter with Javier, struggled with Veronica’s new relationship and her pregnancy. In her blog she explained why she never quit. “Alyssa, Andrew and Anthony would be the only three people on the face of the earth that could convince me not to give up on life. 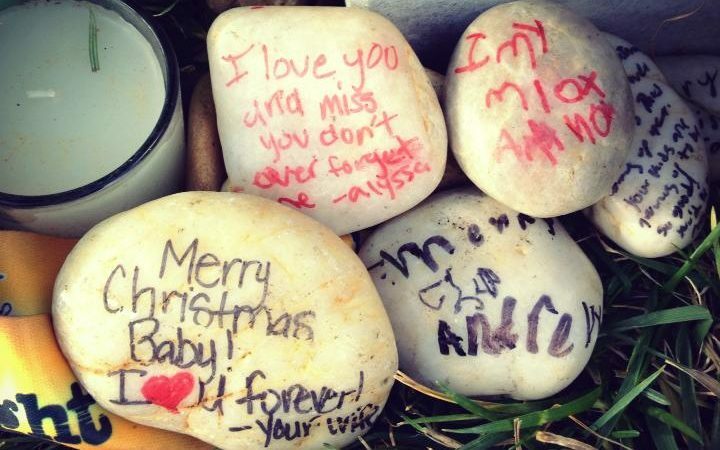 Alyssa, Andrew, and Anthony were the only reason I chose not to give up and take my own life. They needed me. I was the only parent they had left,” she wrote. Her kids were the only reason she says she didn’t kill herself. But that’s something that troubles her children, because they want her to be happy. Her daughter, Alyssa, also worries she won’t be happy. Alyssa refuses to be consumed with sadness, she said. She remembers her “papi” as a generous and righteous man. He was the focus of a recent assignment for school, and she smiled as she read it. “He was a good husband, friend, brother and most of all, a good father. 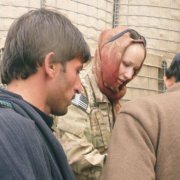 Until one day, my world was crushed – ruined when I found out my dad passed away in Afghanistan,” she wrote. On December 8, 2014, Junior and Veronica drove past rows of stick-built, single and two-story homes baring a façade of neutral vinyl planks and soft stone, just like they had done many times before. Children on bicycles sped past hundreds of matching mailboxes across what could be an endless racetrack. Neighbors waved hello and took a break from manicuring their lawns to laugh and joke. American flags flapped and crumped in the wind, and decorative iron streetlights made morning dew glisten amber. As Veronica and Junior pulled onto Stone Court, they disappeared into a labyrinth of aging pines and other newborn homes. They brought their son, Kaleb, home for the first time. Their red lacquered front door often bears a wreath of woven tree branches, white orchids, blue lilies and red roses. Beneath it, a photograph taken years ago is adorned with symbols of honor, courage and loss. Inside the foyer, a swirling script spells out “In Memoriam” below a portrait of a smiling man. His face is clean shaven, and his chestnut hair is tightly trimmed to his scalp. Piping lines his Marine dress uniform. Years after his death, Javier still has a presence in their home.